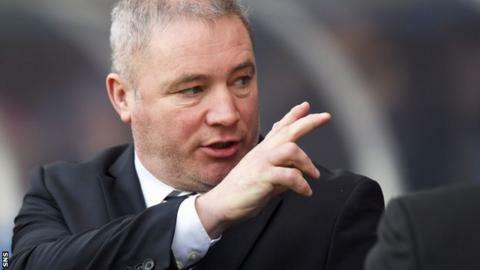 Rangers manager Ally McCoist will hold talks with the Rangers board before deciding if he will attend Monday's annual meeting. McCoist is working his 12-month notice after handing in his resignation. And the board is likely to be questioned about that situation - and financial problems - by shareholders. "I will definitely speak to the board in the next 24 hours and see if I am required to go or they want me to go," said McCoist. "I am not sure I am required to go. I don't know what the legalities of it are. "If anyone wants me there, I will be there. That goes without saying." Rangers need to find £8.3m if they are to survive beyond 1 April and presently do not have the money to pay off McCoist. The Glasgow club have also been called to a hearing by the Scottish FA, which is investigating whether rules have been broken over the role of shareholder and Newcastle United owner Mike Ashley. Shareholders are also likely to ask questions at the AGM about the role of Ashley, whose business associate, Derek Llambias, was named Rangers chief executive on Friday. "Will I stay away unless I'm told to go?" said McCoist. "No, that is not the case. I will have a chat about it. I don't think this is a massive issue at all. "I think Walter Smith used to go to some of them. I don't know if he went to them all. "I know I went to one last year, but I don't think it is a massive issue. "If it is a requirement, I will definitely be there. If need be and people want me there, I will be there." McCoist was speaking after his side beat Livingston 2-0 at Ibrox to remain nine points behind leaders Hearts in the Scottish Championship in front of an official crowd of 28,083. Amid suggestions that the figures are inflated, the manager said he could understand why many fans were staying away. "I have felt unbelievably sorry for the fans over the last three years, to be honest," he said. "I am not sure attendances are a worry. Obviously, when we are playing at home, I would far rather the team were being supported by 50,000 rather than 15,000, 20,000 or 25,000. That goes without saying. "However, I do understand, 100%, the vast majority of fans' feelings over the last three years. "Will we get those fans back? Yes. In the short term? I don't know about that."